Police officer Eddy Pichardo lost his early lead to Eddy Olivares on Friday in the school board race for a one-year unexpired term, according to unofficial election results. Olivares gained a 262-vote lead against Pichardo after Passaic County election officials counted mail-in ballots. Provisional ballots still remain uncounted. “Same thing has happened in other places. The bottom line is every vote has to be counted. They are still not done yet. They are still counting some provisional ballots. Let’s wait and see,” said Olivares (pictured, center) on Friday evening. Olivares isn’t celebrating yet. He said he is crossing his fingers and patiently waiting for all the ballots to be counted. Pichardo, who was celebrating on election night with a wrestling belt around his shoulder, could not be reached for comments for this story. He had a small lead on election night and appeared to be at risk. Pichardo had a tough time during the campaign. At one debate, he asked one of his running mates what to say, when a moderator asked him to make introductory remarks. 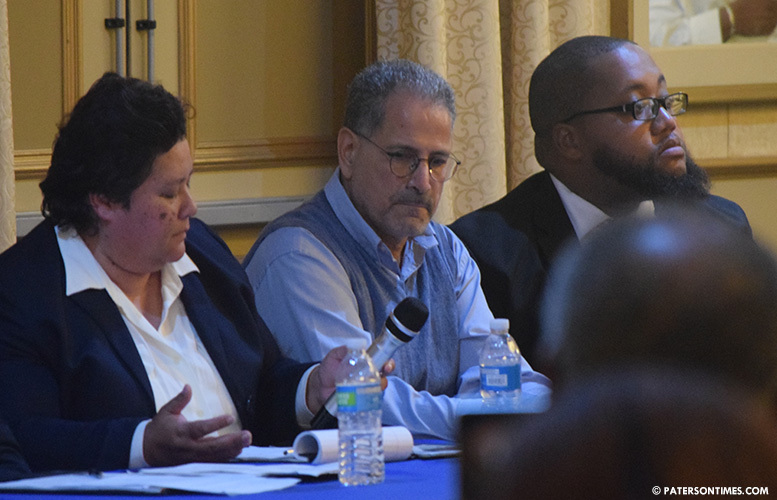 Before that, he sought a vacant seat on the school board, but was rejected after claiming majority of Paterson students were engaging in criminal activities. Pichardo later said he misspoke. Seven people ran for two truncated-term school board seats. Incumbent Vincent Arrington has maintained a slight lead in the race. Arrington has 3,963 votes, according to unofficial results. He continues to remain at risk of losing. He is ahead of Olivares’ running mate, Robinson Rondon, by just 56 votes. Pichardo, Arrington, and three incumbents, who ran for full-term seats, ran as a bracket. The vote tally in the 10-person full-term race did not change much after the mail-in votes were counted. Oshin Castillo, Nakima Redmon, and Manuel Martinez, Jr. remain safely ahead of the other candidates in the race. The closest challenger, Eddie Gonzalez, is behind by almost 1,100 votes, according to unofficial election results. Olivares said he opposed Passaic County officials rejecting hundreds of mail-in ballots. The Passaic County Board of Election has rejected valid votes in the past by citing signature mismatch. For example, in a hotly contested 2nd Ward race two years ago, a candidate was able to recover seven mail-in ballots from the rejection pile to win the council seat. Olivares said as many as 400 mail-in ballots have been rejected. This number could not be confirmed with Passaic County Board of Elections on Friday night. Passaic County election officials are expected to count the provisional ballots on Monday.